So much for Washington not trading Su'a Cravens. When the Broncos acquired safety-linebacker Su'a Cravens in a trade with the Redskins, the team also inherited the rookie contract he signed with Washington in 2016. Denver has two fourth-round picks and three fifth-round picks, and it's unclear which picks they're giving up in the deal. Cravens was a second-round pick by Washington in 2016 following a standout career at Southern California. Expected to be a starter last season, the 6-foot-1, 225-pound Cravens was sidelined last August following knee surgery to fix a torn meniscus. Washington has been shopping Cravens this offseason after he missed the entire 2017 season while contemplating an early retirement. Cravens' agent said a year ago that Cravens was diagnosed with Post Concussion Syndrome but now Cravens is "asymptomatic and cleared to return back to all things football". 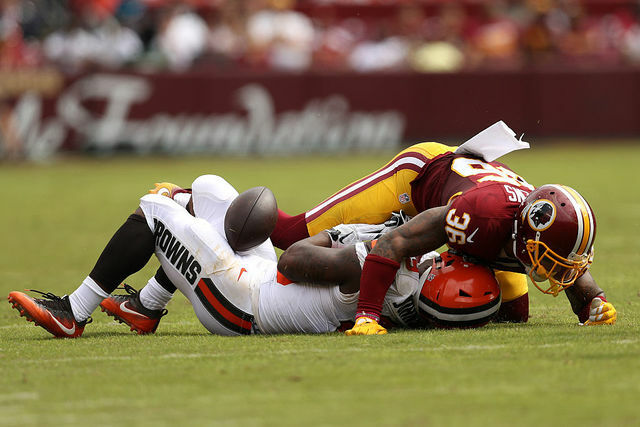 Prior to that, Cravens' agent released a statement saying the 22-year-old was fully recovered from post-concussion symptoms and wanted to make a return to football. If Cravens is good to go in 2018, this looks like a good move for the Broncos. And this: "Pack your bag kids (we're) going snowboarding".